This Irish wall cross includes the blessed words that symbolize the Claddagh: Love, Loyalty and Friendship. The Celtic wall cross features a dimensional Claddagh along with the sentiment of the Irish symbol and measures 5 1/2” wide x 7” tall. 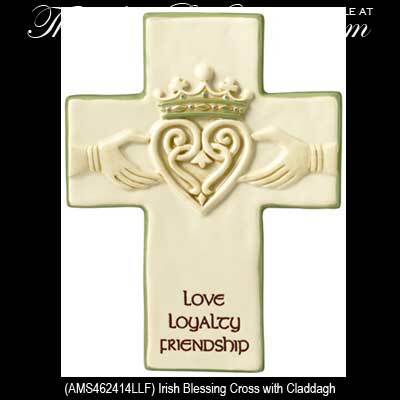 The Celtic cross is made of ceramic and is gift boxed with a Claddagh legend card, complements of The Irish Gift House.